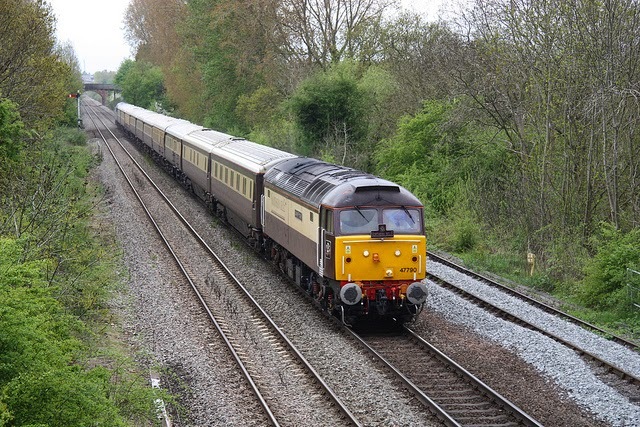 My post on the varied history of Class 47 locomotive 47 790 certainly has had the tongues wagging over on Railforums, with the subject now having had well over 1,400 views, thanks to Tim who linked the post there, with 20 replies (see here for original post). Tim has been sending me some of the replies, and one of them not only fills in the gaps in the original post, but lovingly glazes them with honey and then adds chocolate buttons for good measure. Everything you wanted to know about 47 790 in a nutshell! Crewe Diesel: 06/02 - 01/04. Stored at Healey Mills on 01/04/2004. which gave rise to the "47/8" sub-class). Now that it what I call informative, and particularly pleased the mystery about the return to 47593 has been resolved. Many thanks to sprinterguy on railforums and for Tim for forwarding the reply to me. I think that calls for a pic of 47 790 in her current glory pulling the train she is liveried up for - the Northern Belle. Here she is at Kemp Eye on a Swansea - Chester run in May 2013. The pic is by Phil Martin whose Flickr page you can access here. The sooner they get rid of those ghastly old 37s the healthier Norwich will be!